Finally, we are doing some hands on things. let me give you a quick break down of what we have done so far. - We did this on our first day, and we practiced on a mannequin. - One of the doctors from the hospital came and showed us how to ventilate a patient in a emergency situation and other situations. 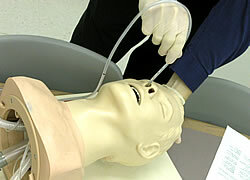 We learned how to put a respiratory tube into the patient lungs. - One of the senior nurses from the hospital showed us how the ventilation machine work. Also, pay attention to everything that is taught in PDI - in MD 4 because we had a quick review of history taking and all the procedures as well, which we were told that we will be using very often in clinical practice. 4 comments to '' "
It's good for medical students that launch some hospital equipment in class-room but SJSM graduates looking best assistance and I prefer you to join graduate admissions essays service because it's best for all students. Thank you! This blog can help medical students a lot in observation. Medical students must learn about writing dissertation. https://www.litreview.net/our-literature-review-writing-service/order-your-dissertation-literature-review/ is something great to know which is good. This clinical program explains true fact about medical terms. Students must visit on this page and get useful information with best knowledge. Students must do practices. Yeah these practices will strong their minds and they will able to apply in hospitals. Also on this website i read very informative experiments which gives best transition.